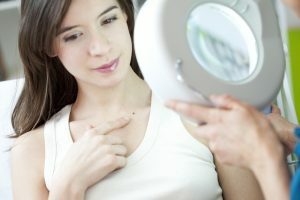 Although most people have heard that a full Skin Examination by your dermatologist is the best way to detect skin cancer early, when it is most treatable, many people delay or avoid the full skin exam. A full skin exam is not a difficult procedure. To prepare for the exam, it is best to come to the appointment without any makeup, nail polish or hair pieces. The doctor needs to see your natural skin for an effective exam. If you know in advance of areas on your skin that stand out as possible areas of concern, it is a good idea to make note of them in advance and tell the doctor. People often notice changes on their own bodies and may highlight an area that needs special attention. At your appointment we will go through a history of your sun exposure, such as how much sun exposure you have had over the years, if you recall sunburns, etc., and ask if any specific moles or other spots cause you concern. Since skin cancer can appear anywhere on the body, the exam is “head-to-toe” with attention given to the areas most commonly affected by skin cancer — the ears, nose and back of the neck. However, because skin cancer can appear anywhere, the examiner will even look between your fingers and at the bottom of your feet. If you would like only a certain part of your body examined — for example, a particular area of concern — we can do that as well. We encourage you not to be concerned with shyness, but rather remember that most skin cancers really are treatable with early detection. Our board certified team is adept at these exams and the body scanning is actually very quick. If there are areas of concern or that need to be watched over time, the doctor may photograph them for your file so that a comparison may be made with photographs from a later date. At the end of the exam, you and the doctor will discuss any findings or recommendations. We strongly urge you to come in for a check. We will be sensitive to your needs and promise to make you as comfortable as possible. It is well worth the knowledge that you may retain long-term health after a brief all-over skin check!